After a much deserved week of R and R in the beautiful resort town of Kep, South Cambodia, most of the team have arrived back to Australia well rested and very well fed! The week at our favourite workplace, Angkor Hospital for Children, seems so long ago. But what a fabulously successful week it was. This was my 25th trip volunteering with OHI. After so many one would think that it was routine and just another project. But it is so much the opposite. Every time I travel with an OHI team I am enormously inspired by their incredible generosity and the ability to do such an amazing work within the most unfamiliar of surroundings. It is a credit to the true Australian spirit to “get in and get on with the job”. Yet again the OHI Cambodia team did incredibly difficult work with great success, and made some wonderful friends along the way. I couldn’t thank the team more. This project had many highlights and conquered many hurdles. After a year of research and hard work by Kym Stuart, Open Heart International gifted the fine instruments necessary to do the operating work required. These instruments are very delicate and expensive and absolutely necessary for the independence of the Cambodian team. 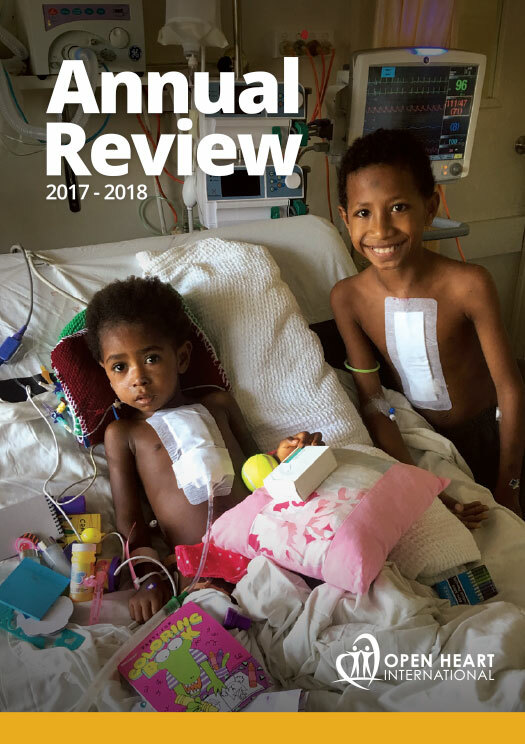 But the sweetner on top was the fact that the Cambodian team was able to do a whole operation by themselves with no interception by our team – in both the Operating Theatre and in the Intensive Care Unit. This is such a reward after only two years of the project. A big congratulations to all of the volunteers, past and present, and to the other international teams involved! The only way to ease the pressure of 1500 children on the waiting list at AHC is to successfully teach the Cambodian team the skills required and, to date, all specialties within the local team have come a long way to achieve this goal. Another highlight was that our 2 sponsored boys from March 2013, Vath and Chea, came back to visit us. To our delight Vath was awaiting our arrival for a pre-operative check. Last year he presented with blue lips and fingers, secondary to the complications of his illness. He was too sick to undergo a major operation so the team did a difficult surgical procedure to partially correct the problem in view of improving his health and prepare him for a major operation in the future. We are pleased to inform everybody, especially sponsors Killara Public School and teacher Cath Roberts, that his health is much improved and he is now able to have the full operation in October this year. Also by surprise our orphaned boy, Chea, visited the hospital to say Hi to the volunteers on Thursday. He recognised a few of us and has now been unofficially adopted by the Australian team. He lives in an orphanage in Siem Reap and the director has invited us to visit him each project. We will keep you informed of his progress every 6 months, as the team ensures he stays happy and healthy. As I write, his sponsors, Jan and Geoff, have just visited the orphanage to meet him for the first time. Without doubt this will be a very special time for them both. I am very happy to report that the 19 year old boy (initially reported to the team as a 14 year old – he seemed to age very quickly on arrival) successfully underwent mitral valve repair. Unable to be classified as a child at the age of 19 he slipped in the back door of AHC as there is no free healthcare for adults in Cambodia. His family impoverished, there was no other option for him. Regardless of his age he joined our team of kiddies for play therapy and arts and crafts – especially enjoying the tattoos! 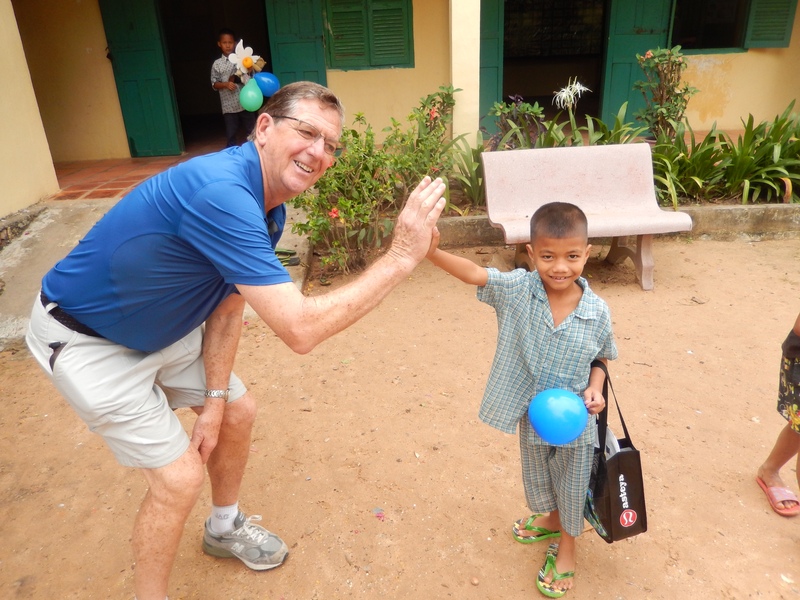 With another Cambodia project under our sleeve I am thrilled to inform everybody that all 14 children that we operated on have now been discharged from hospital without complication. This is a credit to all the volunteers and sponsors involved, and their skill and dedication shown throughout the program. Thank you all – we couldn’t do it without each and every one of you. On a lighter note I would like to share a few conversations overheard in the corridors and streets of Siem Reap over the last year, below are the quotes. I have also put together a video of some photos from the memories we created during our week away, enjoy! Most sincerely, thank you to everybody involved once again. Cambodian nurse: “Yes – younger and bigger.” Gee thanks!! Cambodian nurse: “I know, I hear you arrive from home” Surely we can’t be that noisy! !